 The southernmost part of the Vercelli district is characterised by the meeting of the paddy fields and the green Monferrato hills. In this special setting there is a 25 kilometre route along peaceful dirt tracks that coast the River Po and cross woods and paddy fields. The area is part of the Parco Fluviale del Po e dell'Orba (River Park of the Po and Orba Rivers), typical for its extensive gravel banks and oxbow lakes, wetlands not far from the river, populated by animals and plants. Itinerary: Starting from the town of Crescentino, the route continues along the road to Brusasco; before coming to the bridge on the River Po, it turns left towards the hamlet of Mezzi di Verrua Savoia along a narrow surfaced road at the end of which it turns left towards a small votive chapel and continues past the bridge over the Doretta Morta. Turning right at the first fork and travelling down a long straight road, some of which is dirt track, it comes to a small hamlet of Crescentino, Santa Maria . It crosses the hamlet, following the main road and continues along the only dirt track: this takes you to the picnic area of the Parco Po, located on the bank of the river, where there was once a cable ferry (Portonatante), Fontanetto Po. To coast the river it is necessary to proceed on the right along the bank. It can be quite difficult to cycle along the road and across the two fords, especially after rain has turned them to mud, but once beyond these obstacles you come to the road that leads from Palazzolo Vercellese to the River Po. Follow this road on the left to the village and then take an old provincial road which quickly reaches Fontanetto Po. At this point, follow the directions on the right for the public weighbridge and, once there, take Via San Genuario. From here it is possible to return to Crescentino, taking a dirt track which winds through the paddy fields. When you reach a fork in the road, always bearing right, you will come to San Genuario. Then turn left and after a short distance, left again, onto the provincial road which will carry you to your destination after about 2 km.